a) Pullinger's Coefficent of Linear Expansion Appts : (Vertical Type) Consisting of 50 cms iron pipe with inlet and outlet tubes for steam and opening for thermometer supported in teak wood polished frame. Complete with 3 different metal rods (Iron, Aluminium and brass) without thermometer and spherometer. c) Pullinger's Coefficient of Linear Expansion Apparatus : (Vertical Type) Same as above but with one Meter (100 cm) long Iron pipe. d) Pullinger’s Coefficient of Linear Expansion Apparatus :- (vertical type) Same as above but with one meter long brass pipe. e) Linear Expansion Aparatus :- (Horizontal type) fitted with spherometer 50 cm long steel tube 2.5 cm dia N.P. with inlet and outlet tubes for steam and opening for thermometer reading to 0.01 mm with three different metal rods. f) Linear Expansion Apparatus :- (Horizontal Type) same as above but with brass pipe. g) Linear Expansion Apparatus :- (Vertical and Horizontal type) Specially design to measure the linear expansion of metals with the help of spherometer. The tube is mounted in a heavy metal frame. It consists of 50 cm long brass pipe 2.5 cm dia and having welded inlet and outlet tube for steam and opening for thermometer complete with three different metal rods. 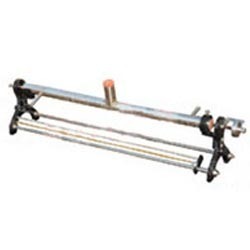 h) Linear Expansion APPARATUS :- (Vertical and Horizontal type) Same as above but with 50 cm long iron pipe. Incepted in the year 2000, at Delhi (India), we, “Everest Scissors”, are involved in Manufacturing, Exporting, Trading & Supplying optimum quality range of Soil Testing Equipment, Bitumen Testing Equipment, Cement Testing Equipment, Laboratory Equipment, Asphalt Testing Equipment, Rock Testing Equipment, Material Testing Equipment, Aggregate Testing Equipment, Concrete Testing Equipment and Metal Testing Equipment. The offered range is widely praised amongst the customers for its consistent performance, user-friendliness, durability, easy maintenance, corrosion resistance and longer service life. This assortment is developed using superlative quality raw material that is sourced from some of the dependable and certified vendors of the industry. We use highly developed technology and latest machine to manufacture this extensive range in accordance with the international standards.